George Bubb Dodington (1691-1762) married Katherine Beaghan (d1756) in c1725, joined the Society of Dilettanti in 1742, served as envoy to Spain in 1715-17, and as MP (Whig) for Winchelsea in 1715-61, and Bridgewater in 1722-54. He also held several lucrative government positions, for example he was a lord commissioner on the Treasury Board in 1724-40, he was Treasurer of the Navy in 1744-51 and 1755-56, and was the Prince of Wales' Treasurer of the Chamber in 1749-51. He was an ambitious man, keen to rise to a peerage, and Horace Walpole described him most unkindly as 'the vilest man, vain, ambitious, loose, and never to be satisfied. He wants now to be a lord and when he is that he will want to be a duke', and he was, indeed, created Baron Melcombe of Melcombe Regis in 1761. In 1720 Dodington had inherited Eastbury, Dorset, from his financier uncle, George Dodington (1658-1720). The house was completed, at a cost of £140,000, by Roger Morris (1695-1749), having been started by his uncle in 1718 to designs by Sir John Vanbrugh (1644-1726). Morris was also to build Dodington's house in Hammersmith, La Trappe, located beside the River Thames. According to the Oxford Dictionary of National Biography in both properties, as well as his townhouse on Pall Mall, Melcombe 'surrounded himself in tasteless splendour'. 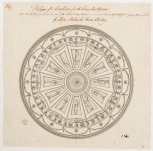 In 1757-61 Dodington (later Melcombe) was in correspondence with the Earl of Bute, and was also friends with the Duke of Argyll, and it was most likely through one of these connections that shortly before his death in 1762, he employed Robert Adam to make designs for La Trappe. These were for a large and ornamental garden pavilion, and a chimneypiece for his dressing room. The dressing room chimneypiece was not executed, but it is possible that the designs for garden pavilion were. In a recent presentation of research at the Paul Mellon Centre, Clare Hornsby provided evidence of a Doric Temple on the estate. Whether this was executed to Adam's surviving designs is perfectly possible, but not known. Plans and elevatons of the house (later called Brandenburg House) are given in the fourth volume of Vitruvius Britannicus (1767). Melcombe died at La Trappe, and everything but the Eastbury estate - which was entailed to Richard Grenville, 1st Earl Temple - was inherited by his cousin, Thomas Wyndham. La Trappe was demolished in 1822, from which time there survives a demolition sale catalogue, and Cherry and Pevsner describe it as 'lost without trace'.